Mrs Meyers, a brand synonmous with home cleaning products, took a big step to venture into the personal care category. Armed with their cult-status scents, they needed in-store elements that not only separated them from the competition, but also informed their current consumers that body care products were available. Although the hero scent of this toolkit is Lavender, each element was designed to be able to flex across their other key scents, Honeysuckle and Basil. Utilizing the iconic Mrs Meyers "line lady" we held a photoshoot in order to incorporate real-life photography with the illustrative world of Mrs Meyers. Using a woman and hand model, we can quickly cue shoppers in-store that these products are to be used on your skin instead of throughout your home. Fun die cuts of bubbles, loofah hot air balloons and airplanes with shower knob propellors ensure these elements stand out in the crowded personal care aisle. We grouped the products on endcaps with shower brushes, bath bombs and towels. Plus-up versions of both the counter display and floor display were also designed, incorporating paper flowers and leaves for a more immersive experience. 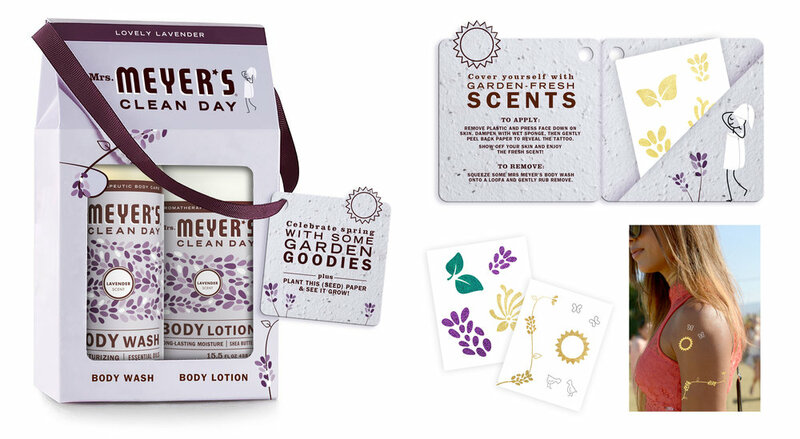 Garden-inspired bundle packs of seed paper and scented temporary tattoos that leverage our unique line lady assets create a fun scent experience that connects directly to body care. Unique elements were also designed for the new hand sanitizer product (with Basil hero scent). The cart sign introduces the product in a place where shoppers are already thinking about germs, on their cart handles, and drives them to try the product at checkout with 3D line lady counter displays.